Mr. Marsh received his B.A. in History from Transylvania University in 1988 and is a 1991 graduate of the University of Kentucky Law School. Mr. Marsh began his legal career as a prosecutor in the office of the Bourbon County Attorney in 1991. 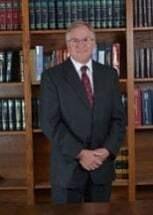 Mr. Marsh, a Johnson County native, then worked in civil litigation throughout Eastern Kentucky beginning in 1992, first for Boehl Stopher & Graves, and later for Neeley & Reynolds, both based in Prestonsburg in Floyd County. In between, he was a prosecutor in the office of the Commonwealth's Attorney for Johnson, Lawrence, and Martin Counties. Mr. Marsh is licensed to practice throughout the Commonwealth of Kentucky, and has represented clients in almost half of Kentucky's 120 counties. Mr. Marsh is admitted to practice in the U.S. District Court, Eastern District of Kentucky, and the U. S. Bankruptcy Court, Eastern District of Kentucky. Mr. Marsh has served on the Executive Committee of the Kentucky Young Lawyers Association and the Board of Directors of Kentucky Defense Counsel, Inc.
Mr. Marsh acted as Master Commissioner for Lawrence County for almost ten years. Mr. Marsh's practice is focused on medical malpractice, business litigation, insurance law, including both personal and commercial lines, oil and gas litigation, and general trial practice, and he has been mediating civil cases in Kentucky since 2000.